Powers/Abilities: A master swordsman, particularly good at fencing. He is also skilled with a whip. In addition he is a master horseman, extremely fit, and very acrobatic. History: Born in Madrid in 1793, Diego Vega emigrated to America with his parents Alejandro Vega and Elena Felicidad soon after his birth. They settled in California, becoming rich land owners, and although Diego returned to Spain to study art and science at Madrid University, and to learn fencing from the English knight Sir Edmund Kendel, he always considered California his home. Back in America things had taken a turn for the worse. The ruthless Alcalde gained power in California, and used his position of influence to exploit and rob the poor people of the area. Alerted to this by his father, Diego returned home. Knowing that open opposition might bring disaster down on his family, Diego passed himself off as a fop, while secretly adopting the masked identity of El Zorro (the Fox), a bandit in black upon the black stallion Toronada, who stood up for truth and justice against the oppressors. While his friend Felipe (a.k.a Bernado) pretended to be a deaf mute and thus spy on Alcalde for his master, Diego would venture out from the caves underneath his father's Hacienda to strike terror into his enemies. Comments: Created by Johnston McCulley, a former newspaper crime reporter who had turned his hand to writing. 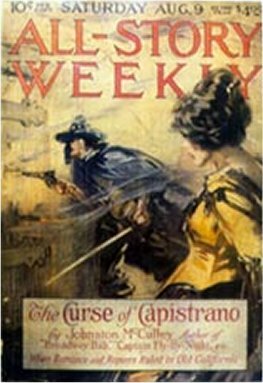 The first Zorro story, The Curse of Capistrano debuted in 1919 in the pulp magazine All-Story Weekly. Though the original look (below, right) for the hero was slightly different from the one which he would become best known for, many of the major components were in place - the mask, cape and sword. 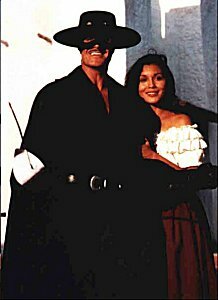 Curse ended with Zorro unmasking (in the second to last chapter), and revealing to everyone in the pueblo of Los Angeles, as well as the readers, that the Fox was Don Diego. It seems clear that no sequel was planned. Perhaps this might have been Zorro's sole appearance, had Hollywood not intervened. In 1920 the silent movie, an adaption of Curse called The Mark of Zorro was made, with Douglas Fairbanks as the hero. Zorro became a household name, and the public demanded more adventures. Publishers Grosset and Dunlap re-released Curse under the title The Mark of Zorro to tie in with the movie. Two years later McCulley bowed to demands, and The Further Adventures of Zorro was released in Argosy Magazine. 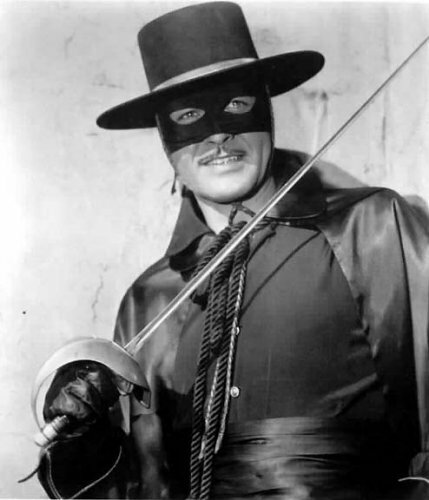 McCulley would continue to write Zorro stories on and off until his death in 1958, the year after the Walt Disney tv series which made his character a world-wide phenomenon debuted. The final story written by McCulley, The Mask of Zorro, was published after his death, early in 1959. After McCulley died, others have occasionally turned their hands to writing Zorro books. Moonstone Publishing recently announced plans for a new prose Zorro short story collection. In 1949 Dell Comics brought out the first Zorro comics. Printed in Four-Color (which was eventually renamed Zorro), they initially adapted the novels. The Dell series is considered somewhat of a classic, with art by the great Alex Toth. Fifteen issues were produced, which have been reprinted in a hardback anthology in 1988 by Eclipse Comics as Complete Classic Adventures of Zorro, and in paperback anthology by Image Comics in 1999 under the same title. After Dell, Gold Key produced 9 issues of a Zorro comic in 1966. As well as the aforementioned 1988 reprint, Eclipse also released Zorro in Old California. Marvel was next with a Zorro title in 1990 - it lasted 12 issues. Of recent years Topps Comics probably made the biggest impact. 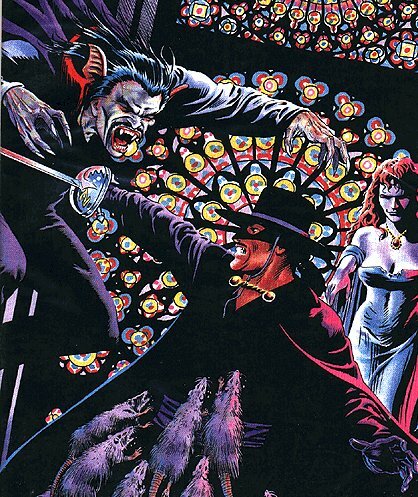 In 1993 they released 12 issues (#0 to #11) of a Zorro title, as well as Dracula vs.Zorro, a 2 issue mini-series. They also created a female counterpart and ally for Zorro, Lady Rawhide, who spun off into 11 issues of her own (two series of five issues each, plus a special). Image Comics produced a tie-in with the movie, The Mask of Zorro, and also reprinted much of the Topps work in the late 1990s. Then Americomics released two one-off Zorro specials in 2002, Hand of Zorro and Sword of Zorro. Zorro also had his own newspaper strip (daily and Sunday strips) for two years, distributed by Creator's Syndicate. It was written by Don McGregor and drawn by Thomas Yeates. 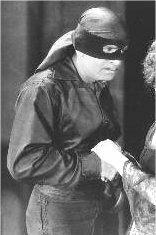 Henry Darrow as Don Diego; Paul Regina as Carlos de la Vega, Zorro Jr.
As stated above, the 1920 Fairbanks' movie The Mark of Zorro was instrumental in giving the character the exposure it needed to ensure longevity, and as a direct result Zorro returned to the written page. Meanwhile in the cinema, Fairbanks also returned to the Zorro fold, this time playing Don Q, Son of Zorro. Others soon followed. Republic produced five serials between 1937 and 1949, while Tyrone Power donned the mask in a talkie remake of Fairbanks' The Mark of Zorro in 1940. Zorro made it to television in 1957, when Walt Disney cast Guy Williams in the part. He played the part for three seasons and 82 half-hour episodes between 10th October 1957 and 2nd April 1961. Two cinema movies, edited together from episodes of the series, were released: The Sign of Zorro (1958) and Zorro, the Avenger (1960). 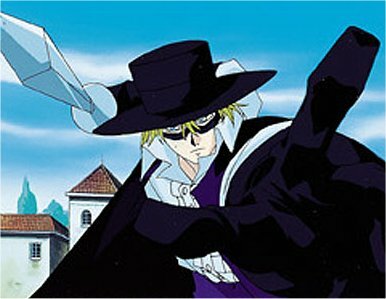 The show made lasting alterations to the legend, changing Diego Vega to Diega de la Vega, and altering how he hid his identity - in the books everyone knew he was a good swordsman, so Diego acted as a boor and bigot, rude and snobbish to those below him in the social strata; in the series Diego was a likable but apparently ineffectual fop. Shown across the world, it's opening theme introduced Zorro to legions of new fans: "Out of the night, when the full moon is bright, comes a horseman known as Zorro. This bold renegade carves a Z with his blade, a Z that stands for Zorro. Zorro, the fox so cunning and free. Zorro, who makes the sign of the Z." The show's success would have meant it went on longer, if not for a dispute between Disney and ABC. In 1992 Disney colourised the entire series, and re-released it. Made by Filmation, and aired as part of 1981's Tarzan/Lone Ranger/Zorro Adventure Hour, with Henry Darrow providing the hero's voice, the first Zorro cartoon only had a short run of thirteen episodes between 12th September and 5th December. 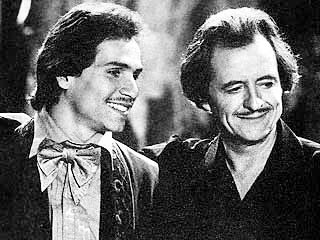 In 1983 Henry Darrow got to play Zorro again, this time in a live-action Disney comedy series. Paul Regina played his son Carlos, a.k.a. Zorro Jr. The show, which aired between 6th April 1983 and 1st June 1983, only lasted five episodes. 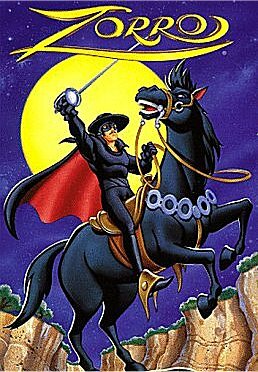 1992 saw Italy's Mondo release fifty-two episodes of their cartoon version of Zorro. Diego has become a Ghost! The Stagecoach is in Danger! Blast of the Demonic Cannons! In 1997 Michael Gough became the voice of Zorro in a new Warner Bros. cartoon series. Twenty-six episodes aired over two seasons between 20th September 1997 and 12th December 1998. 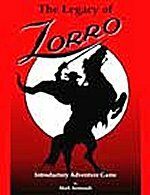 In other areas, Zorro has also been featured in a number of stage plays across the world, including a West End musical in London in 1995. Additionally in 2001 Gold Rush Games released a Zorro Role-Playing Game, Legacy of Zorro.